With telecom companies planning to differentiate voice calling through apps like Viber, Tango and so on, the users are surely going to turn to alternate ways of communication with their loved ones across the globe. You end up shelling out quite a lot of money if you choose to make a call through your telecom operator. So what exactly is the way to go about doing things in future? 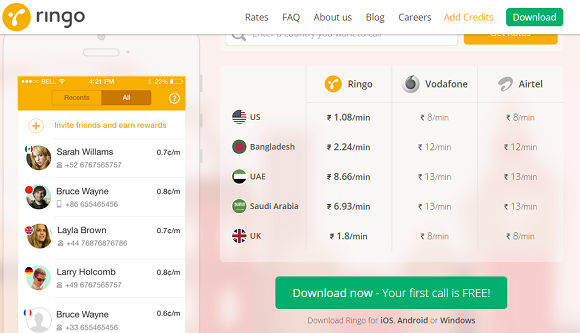 Ringo, an international calling service has just been launched in India, and this allows high quality-calling without using the internet at a low cost. The app has been aimed squarely at people who frequently make international calls for keeping in touch with their loved ones or for business purposes. A stable and high-speed internet connection is a pre-requisite if you decide to go the VoIP (Voice over Internet Protocol) way and finding that is still an issue. The app claims you can save up to 70 percent of your bills if you use Ringo for making international calls. Ringo does not use Wi-Fi, data or minutes from your calling packs to make calls. You need to make a call through it in a similar manner as you’d do through your regular carrier. Ringo makes use of a special call flow to convert international calls into local calls. For instance, when a Ringo user from India makes a call to someone in Australia, the app will dial out a local call to the Indian user and another local call to the Australian user. After this, it will connect the two over carrier circuits. To put simply, you need to pay a little over your regular local call tariff to make an international call over Ringo. The service has fixed per minute tariffs for calling landlines or mobile phones in different countries, and they range from Rs 1.08 a minute for calling countries like the US and Canada, to Rs 8.66 per minute for calling UAE. According to the press release, India is number four globally when it comes to being an originator of ISD calls and Indians spend over $2 billion every year on making international calls. The app’s prices are 70% less than Vodafone or Airtel’s and 20% cheaper than Skype or Viber’s for majority of the destinations. Ringo makes use of a unique technology so it won’t be caught in cross-hairs of the issues surrounding VoIP. The Ringo app is available for iOS, Android and Windows Phone for free.